Twitter reacts to Trump's 'scream death' morning rant, which was insane even for him. It's morning in America, which means President Donald Trump be tweetin' semi-coherent sentences. And this time, presumably perched on his toilet, Trump is tweeting his way through the stages of grief over the death of Obamacare. Right now, the president is still stuck at #1: Denial. "The Dems scream death as Ocare dies"? It sounded better at the slam poetry open mic night. 1. The GOP's healthcare bill doesn't have the votes to proceed. 2. He has no idea what the GOP's healthcare bill is or what's in it, just that it doesn't say "Obama" on it. Twitter was quick to explicate the poem to Donald Trump. 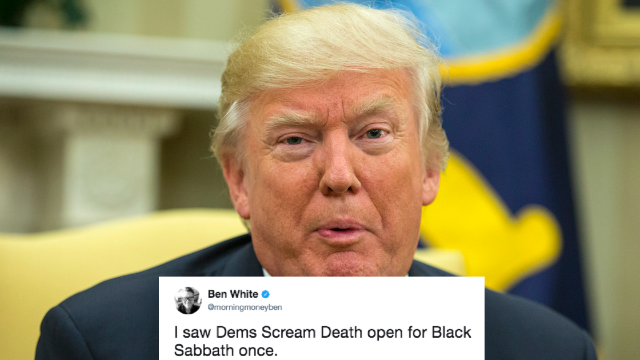 I saw Dems Scream Death open for Black Sabbath once. The Dems scream death as Ocare dies! Alas! Repeal and replace never flies! But fear not! A wall will rise! The White House lunch will feature Trump v. 3 women GOP Senators who are opposed to a bill he knows nothing about. They don't discuss how good it is because it isn't good. It's awful. It'll kill a lot of people. You set yourself up, 45. Oh how I'd love to see a reporter ask Trump, "Name one thing you like about the Senate GOP health care bill?" If you listen you can hear "The Dems Scream Death as OCare Dies" in Minor Threat-era Ian McKaye's voice.